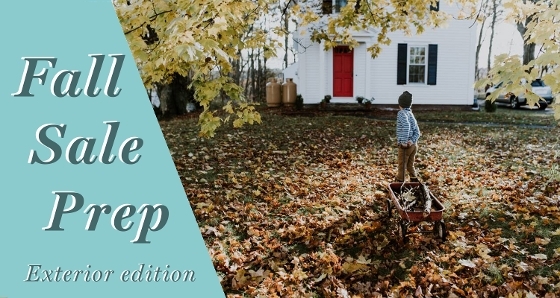 Keeping up with yard work is an ongoing process in the fall, so stay on top of it to keep your property looking great! The term “curb appeal” is making your home look as inviting as possible from the outside. If a home doesn’t look compelling from the street, potential buyers may not take the time to venture inside. Sight: Examine your landscaping with a discerning eye. Have most of your summer blooms succumb to the season? Remove any dead plants or branches and pull out those weeds. Fall is a great time of year to pick up plants and shrubs from your local nursery and there can be excellent deals from nurseries heading into winter. Your trees are turning beautiful shades of orange, yellow and red, those beautiful autumn leaves don’t stay on the trees and as they fall they can make your yard look unkempt and buyers will want to see your lawn. Put in the effort to stay on top of raking those leaves! Smell: Let your nose lead you as you walk around the exterior of your home. Are you greeted with fresh air and fragrance from your autumn flower beds or did you get a waft of your full garbage bin that needs to be emptied? Does your birdbath or water feature smell like stagnant water? Don’t forget to pick-up any poop your furry friends leave behind. Do you keep an ashtray outside? It’s important to remove this on open house days and clean up any cigarette litter that may have accumulated. Touch: Think about buyer-proofing your property with the same approach as baby-proofing your home. Make sure there is nothing that could put a buyer in harm's way while they walk around your property. Wrap up the garden hose, trim back prickly bushes and clear any debris along walkways. Trim trees so unexpected winds don’t knock down branches that could cause damage. Keep up on pool maintenance and make sure it is clean and inviting. Finally, add texture and comfort with pillows, cushions and outdoor rugs will make the outdoor-living space inviting and special. Sound: What are the sounds of your neighbourhood? Is your home located near a school or a busy road? Talk to your realtor about scheduling open houses when recess isn’t in session or avoid rush hour so buyers can hear the true tranquility of the neighbourhood. Do you have an outdoor sound system? Playing soft ambient music is a great way to create an inviting atmosphere. Make sure any prescheduled sprinklers are turned off during an open house. When those rainy days are upon us make sure those gutters are free of clogs, so buyers only hear the calming sound of rain and not the pounding of gutters overflowing. When preparing the exterior of your property for sale, the Grant Gardner Team doesn’t just hand you a generalized list of suggestions. We want to help you showcase your property at its very best and take the time to tailor any tips or suggestions to your home. If needed, we can connect you with the North Shore’s or Vancouver’s best landscapers, handymen and garden centres. Contact us at info@grantgardner.com or 604-990-6468 and our team will help get your home ready to shine!